The Labour Party has announced its support for a ban on importing foie gras. Under its Animal Welfare Plan, the UK opposition party would legislate against bringing the controversial product into the UK, if it came into power. Foie gras is a 'delicacy' made from the diseased livers of ducks or geese who have repeatedly been force-fed. It is illegal to produce foie gras in Britain because of the suffering caused by this process - known as ‘gavage’. However, nearly 200 tonnes of foie gras are imported into the UK from mainland Europe every year for sale in shops such as Harrods and Fortnum & Mason and the menus of high-end restaurants. Leading international farmed animal protection organization Animal Equality has welcomed the Labour Party’s announcement. The group has been key in driving a campaign calling for a ban. Its petition has gained more than 50,000 signatures, garnering support from celebrities including Ricky Gervais, Joanna Lumley, Peter Egan and Steven Berkoff, as well as cross-party support from MPs. Dr Toni Shephard, UK Executive Director of Animal Equality, said: "Leaving the EU gives us a unique opportunity to rid Britain of this extraordinarily cruel product. "Our national laws rightly declare foie gras production too inhumane to take place on our shores, yet we still allow it to be imported and sold. "For the sake of the thousands of ducks and geese still suffering on European foie gras farms, this hypocrisy has got to end. "Animal Equality has filmed inside more than a dozen foie gras farms in France and Spain and found extreme suffering and death in every single one. We are now asking all British animal lovers to add their name to our petition calling for a #FoieGrasFreeGB." These views are shared by some of Britain’s best-known animal advocates, including MPs, who have already lent their support to Animal Equality’s campaign. Joanna Lumley said: "Foie gras production was banned in the UK because it is so cruel. Why then do we still import tonnes of it every year? This must be banned as soon as possible following our exit from the EU." Peter Egan: "The cruel and horrible way Foie Gras is produced by literally stuffing a poor duck or goose with grain until its liver becomes diseased and swells to bursting is disgusting to contemplate. "We banned its production in the UK because it’s cruel. Now lets ban the importation of this cruel product. Make the UK Foie Gras Free!" 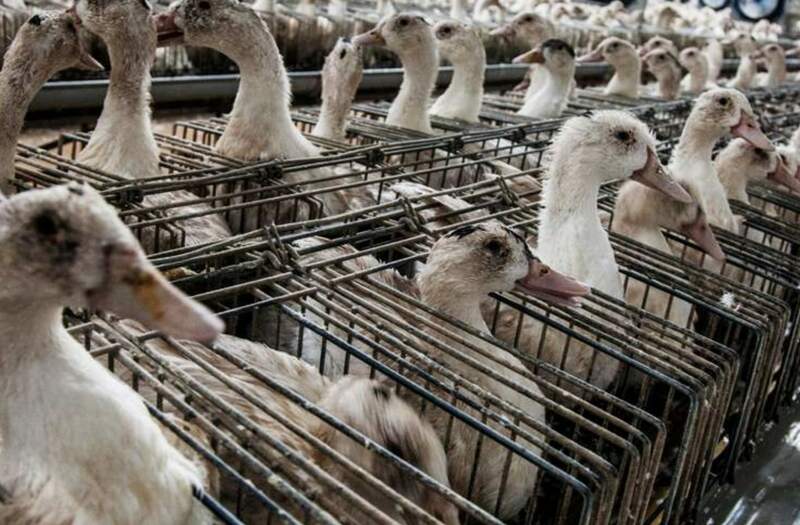 Henry Smith, Conservative MP, added: "The production of foie gras is rightly banned in the UK but, whilst sill EU members, unfortunately we can't yet ban its import. "A real animal welfare opportunity to impose a ban on this cruel practice when Brexit is complete can be realised and I call on the Government to act at the earliest possible time." A YouGov poll conducted in June 2017 showed only a tiny minority of Brits consumed foie gras in the previous 12 months – less than 1 in 10 (seven percent) - and an overwhelming majority support an import ban - 77 percent of those who expressed an opinion.